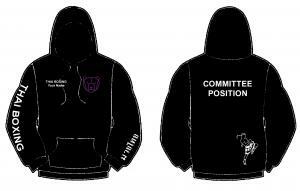 Black ladies fit zipped hoody embroidered with Thai Boxing Bear logo on front left chest in purple and THAI BOXING on front right chest in white. Sleeves printed as per design shown. Back printed with silhouette of Thai Boxer in bottom right. Optional personalisation of a name embroidered on front right chest and Committee Position (where relevant) printed across back.